We spare no effort in visiting what we publish. We don’t criticise projects, we analyse them. We publish a magazine without advertising When we have more to say, we make books. 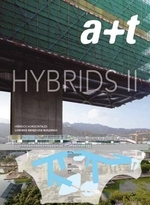 a+t is internationally distributed, independent of any editorial group. It’s up to our readers to choose the adjectives on our publications. we distance ourselves more and more from self-centred buildings, or rather is it the architects who are self-centred?